Crash landing: I am writing to you because I am deeply concerned about a prominent local citizen. Tony Sleiman, a Jacksonville real estate mogul and co-chairman of Herman Cain’s Florida campaign, responded to Herman Cain dropping out of the presidential race by saying that he would update the rock muzak that blares incessantly at the Landing. 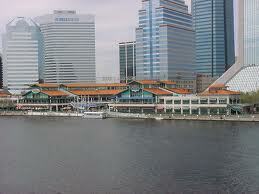 Sleiman is a major Jacksonville developer, and the Jacksonville Landing is the jewel in the crown of his real estate empire. He and I are Republicans. Together, we have our finger on the nation’s pulse. We know where the nation is heading. Over the years, Sleiman has tried to make The Landing the coolest place in Jacksonville. One thing he did to make it a cool place was to bring Herman Cain there for a candidate rally. Hmmm. This video of the Cain rally isn’t working anymore. Wonder why. Sleiman also indicated he may switch his loyalty from Cain to Newt Gingrich.